This is one of chess pieces called Bishop. It looks elegance and posh in black color. Bishop chess piece becomes so elegance in black. Natural color becomes an everlasting attraction for decoration idea. Derived from that idea, we create this Bishop in black and glossy. It is best used for furniture decoration in your minimalist house or office. This Bishop will be a great view of art when it is placed beside the fireplace. In the picture above show the black Bishop chess piece. It has made of Teak wood that have chosen to get the best quality of chess piece product. 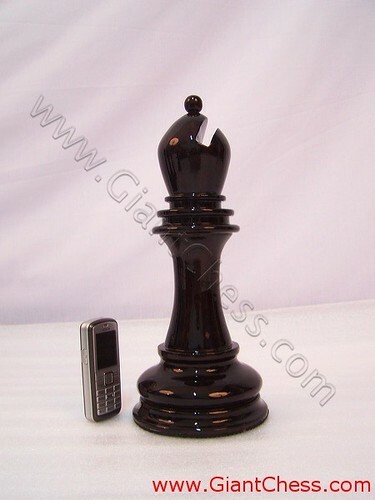 The Bishop chess piece is polished well in black and looks glossy. It has carved by our professional craftsman from Java island that famous about its wooden furniture. This kind of chess piece very popular for kids and adolescent who like to play chess outdoor.